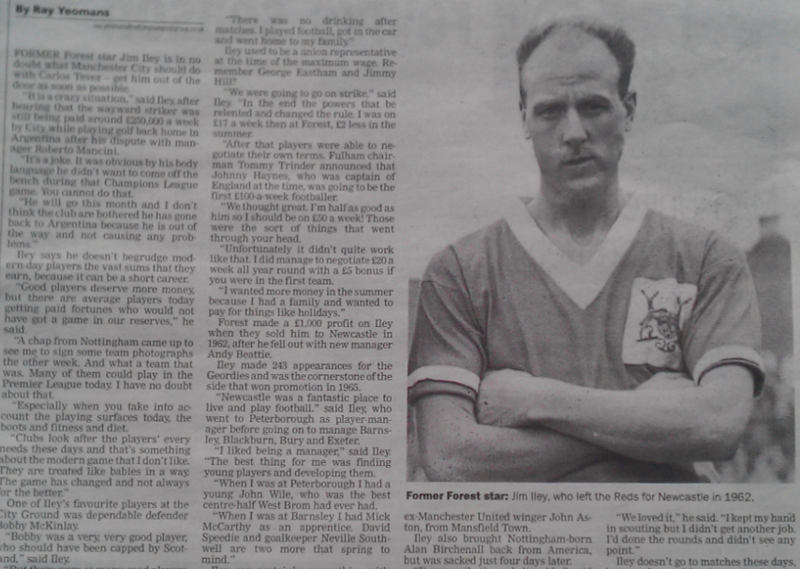 I WAS INTERESTED upon reading a ‘Bygones’ history piece today in the local Nottingham Post about a Nottingham Forest player from the early 1960s named Jim Iley. Jim had an excellent 550-game career at wing-half with amongst others, Spurs, Forest and Newcastle United, as well as becoming the manager of four football league clubs. A man whose opinion should perhaps be respected. We often hear recurrent stories from older ex-professionals that, shall we say, are a little envious of modern day players and the rewards they receive. There is also a belief amongst some fans of the current game that players of Jim’s generation and before were somehow inferior or that the football played was of a poorer standard. This former player gives the lie to those beliefs. I find that interesting. Arguments will always rage about the standards of teams and players in different eras and that’s fair enough – we often believe that ‘our’ heroes were better than those of other eras (I’ll stake a claim in that debate with Pele, Best, Maradona, Cruyff, Platini, et al in my own!) I have to say however that Jim’s second assertion here is spot-on. I think it’s one of the myriad of reasons why fans and players don’t seem to have the close relationship they used to have. Players are mollycoddled and I really don’t think it helps them. To give a small practical example it bemuses me to watch players when the ball becomes dead continually looking to the bench for instructions on how to play the game they are often handsomely paid for performing. Generally speaking it’s a lack of responsibility taking. I don’t however blame football players specifically though as, like so many issues in the game, it appears to be more of a societal problem generally – one that the game only reflects and manifests.